IDHS recently helped the U.S. Army Reserve kick off a new program for veterans. Oscar Trujillo and Maria Raedeke of the IDHS Division of Rehabilitation Services office in Rockford received a Certificate of Appreciation from the 88th Regional Support Command of the United States Army Reserve during the March 2015 Yellow ribbon event held in Schaumburg. The U.S. Army Reserve will establish a national combat veteran reintegration program to provide Reserve soldiers and their families with sufficient information, services, referral, and proactive outreach opportunities throughout the entire deployment cycle. This program will be known as the Yellow Ribbon Program. The Rockford Vocational Rehabilitation Office participated in the March 14th and 15th event with an informational table. There were about 30 other social service tables and more than 400 participants at the event. 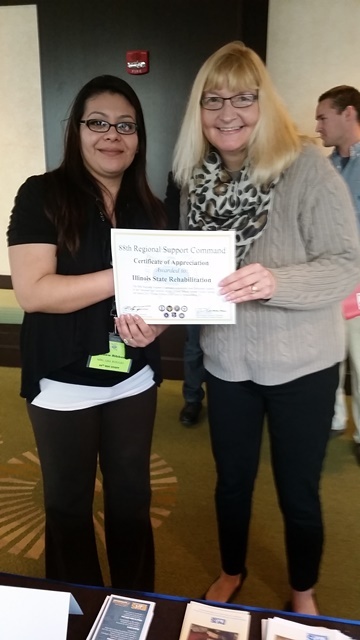 Lisa A. Ruggio, Yellow Ribbon Reintegration Program, U.S. Army Reserve (left) presents a certificate to Rehabilitation Case Coordinator Maria Raedeke (right).